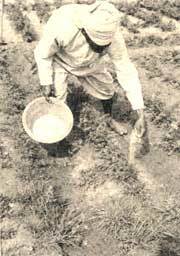 THE Indian Agriculture Research Institute (IARI) has devised now techniques of using fertilisers - through the split application and the deep placement methods and using granules rather than powder - which will prevent the loss of nitrogen into the atmosphere and the water table, and result in higher crop yields as well as counter environmental and health hazards. The split application method, as the name suggests, involves the spread of fertiliser in two or three lots, rather than all at once. With less fertiliser being used in each lot, the plant is able to absorb most of what is applied, thus minimising loss. The deep placement method too is evident in the nomenclature, involving the placing of the fertiliser deep in the soil, during sowing or transplanting of the crop. It is then taken up directly by the plant roots, rather than being dissolved by the water present in the paddy field at the surface level. While traditionally powdered urea is- sprinkled over a field, Rajendra Prasad, head -of the department of agronomy, who pioneered the research, has developed urea supergranules (USG). These are large granules, resembling moth balls, which are spread over a field. While the soil bacteria attack the surface of these granules, very little of the fertiliser is lost, as the core remains intact. Also, the concentrated urea and ammonia emits a strong smell that kills the bacterium, nitrosomonas and nitrosococcus. "There are now plants in Thailand, Malaysia and Mexico manufacturing these supergranules," reveals Surinder Singh, another researcher at the IARI. Neem-coated supergranules are another addition in the IARF8 armoury of weapons to combat fertiliser loss. "We have found that 34 this kills the bacteria and acts as a pesticide and insect-repellent," says Prasad. Nitrogenous fertilisers are used for both kharif and rabi crops, but it is only during the kharif season, particularly with crops such as rice or sugarcane, that the loss of nitrogen from the soil is as much as 40 per cent to so per cent, due to the high temperature and humidity. These are lost in the form of elemental nitrogen into the atmosphere, otas nitrates which dissolve in water and seep into the water table. "This is a tremendous loss to the plant," says Prasad. "Industrialised countries such as USA and UK have cut down on the use of this fertiliser. India can't afford to follow suit because of our growing population which can be supported only by increasing crop yields through fertiliser use and efficiency. We have devised methods to improve the efficiency of nitrogenous fertilisers which are lost in large quantities from the soil." Singh explains how nitrogen loss occurs. "Urea, used as nitrogenous fortiliser, is broken down into ammonium carbonate due to heat and humidity and this is, in turn, converted into nitrates, nitrites and nitrogen gas, by several soil bacteria. "While the nitrates and nitrites dissolve easily in the large amounts of water present in the paddy field and seep into the soil where they enter the water table, nitrogen gas escapes into the atmosphere. About 40 per cent of fertiliser is lost thus from a single paddy field." According to Prasad, "So far, the government has been controlling the fertiliser industry, by levying a subsidy on fertilisers and thus, controlling profits. This means there are no real incentives for the fertiliser industry to manufacture any new fertilisers, as they will not be able to recover sufficient profit to make it worth their while." However, scientists have very little field data to specify exactly how much nitrogen can be saved by using these methods. Singh argues, however, "it all depends on several variables, such as, what the kharif crop is, the size of the field and how much fertiliser is being used." However, the scientists hope that with fertiliser subsidy being abolished in June this year, the industry will take to these techniques. Says Prasad grimly, "We should not ignofe the needs of our growing population, but should concentrate on increasing fertiliser efficiency, any which way, for only then will we be truly self-sufficient as far as our food needs are conearned." So, next time you pass a paddy field and see a farmer scattering what looks like mothballs, you'll know what to think.